I know some people have an odd fascination with the 1970s, but for those of us who lived it, it was a confusing time. Perhaps it’s because it started with the drug-addled hippie era, and ended with the drug addled disco era. 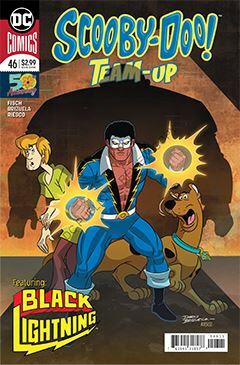 But for a continuity-free title like Scooby-Doo Team-Up, it just makes for fun reading. The 100 have invaded Garfield, and Black Lightning is determined to keep the criminal gang out. But when gangsters of the original kind step out, the Scoobies see a more traditional mystery on their hands. Together, they raid the headquarters of crime lord Tobias Whale, while uncovering the truth behind the Prohibition-era phantoms that seemingly stepped off the Warner Bros. backlot. This story is a little different that most in the series. Rather than a super-hero help unmask a bogus ghost, Scooby & Friends help a super-hero fight crime, complete with their own far out code names straight from a golden oldies play list. Outasight!